Cabbage “thoran” is a dish my mom made often. 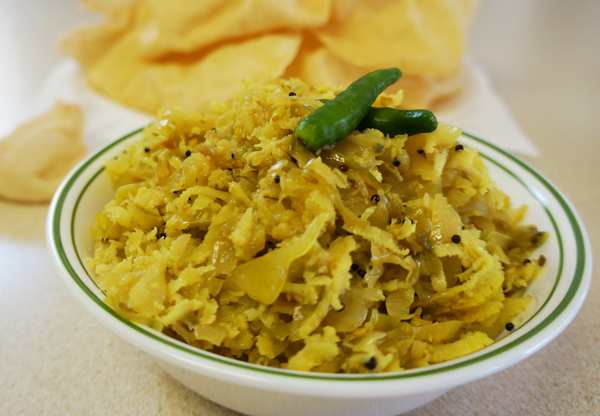 It is a Kerala specialty and the main ingredients are shredded cabbage and grated coconut. Thoran means dry vegetable dish, in that it does not have a gravy. I am sharing with you a basic thoran recipe. You can switch the star ingredient, cabbage, for French green beans, carrots, or spinach. My mom was my favorite chef and I loved the food she made for my family. During dinner, she would often tout the health benefits of the vegetables she cooked. When we had cabbage thoran, her lecture would go something like this: “Did you know that the cheap, humble looking cabbage can do wonders for our bodies? It has more vitamin C than oranges. It helps to repair the wear and tear of our bodies and also treats ulcers and certain cancers, while strengthening our immune system.” I am sure my brothers and sister can hear my mom’s voice right now. I catch myself doing the same thing at my table with my children! My daughter-in-law, Dharti, likes this dish so I find myself buying cabbage more often than I used to. Shredding cabbage is easy to do with a mandoline. In India we used a small stone mortar and pestle to crush the ingredients required for this recipe, but you can use a blender or food processor to do the same job. Coarsely grind the chilli seeds, cumin seeds, finely grated garlic and 2 tablespoons sliced shallots in a food processor. Two or three pulses should do. Add coconut and turmeric and pulse again so that all the ingredients are coarsely ground. Wash the shredded cabbage, drain well and put it in a saucepan over medium high heat. Make a well in the center of the cabbage and add the ground ingredients. Cover the ground ingredients it with a little cabbage and put the lid on the pan. Cook for about six minutes. Stir well and if there is water, remove the lid and let the water evaporate. Remove from heat. Heat oil in a small pan over medium high heat. Add mustard seeds and when they splutter, add the black gram dal and let them brown lightly. Then add the curry leaves and chopped shallots. When the shallots turn light brown pour the seasoning is ready. Pour it over the cooked cabbage. Stir well, garnish with fresh green chillies and serve. This entry was posted in Recipes, Vegetarian and tagged cabbage, Coconut, thoran by Margaret Christo. Bookmark the permalink. Hello dear Margaret! Hope all is well with you. This recipe looks like a good and easy one. I will definitely make it for my family. When are you coming this way? Consuelo and I would love to meet you for lunch. So good to hear from you. I’m in India with my family. All is well and I am enjoying my stay here. Will give you a call when I come. I am really enjoying being with family. Thanks so much for reading and commenting on my blog. Give Consuelo my love. More news later. This really is one of my favorites among the many other amazing dishes you have created also! It’s sooo good and easy to make! Yumm ;p Thanks for cooking for us children and making such yummy food and feeding our bellies with your talent! Hi Nene – So good to hear from you. Liz has tasted this dish so she can tell you about. I’m with family in India and loving it. Take care and God bless you. Give my love to Liz.